Obsidian Entertainment’s games have always been known for their vividly elaborate plots and immense settings (Fallout: New Vegas, Neverwinter Nights 2). 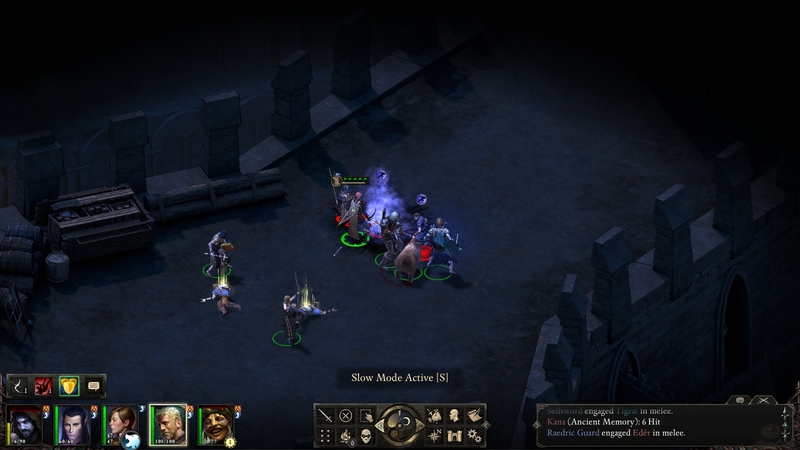 Its latest title, Pillars of Eternity, is every bit as vast and intricate and has a depth that can rival any game. It is the kind of artwork that an artist would consider as one of his most remarkable creations, a work true to his own soul. This real time strategy fantasy RPG is as unforgiving as it is rewarding and it juggles these two concepts like a carnie veteran. In its epic 50-80 hour saga the effects of every choice you make, from character creation to dialogue choices to chosen companions, will ripple through the entirety of the game. 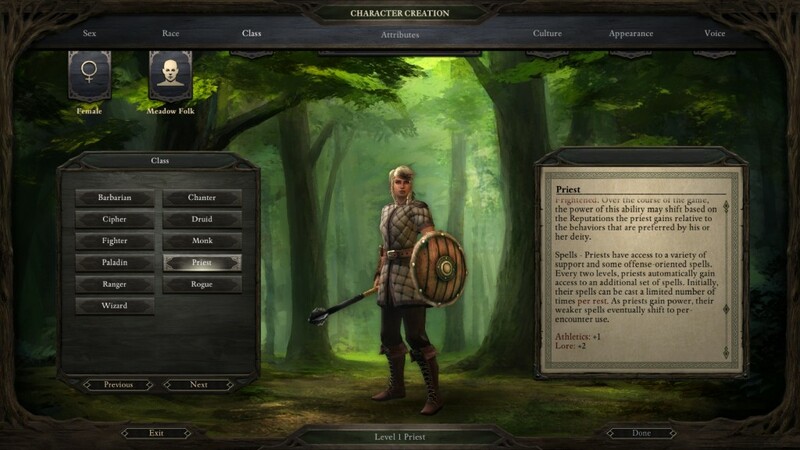 Pillars of Eternity is for the connoisseurs of the RTS and RPG genres. If you were a fan of games like Neverwinter Nights, Planescape: Torment or Baldur’s Gate then you will feel right at home in this title. You are a foreigner travelling to Gilded Vale, a small village found in the Free Palatinate of Dyrwood. Before you reach your destination a series of event leads to the slaughter of your travelling group and you end up on your own. Never the less, you continue onward to Gilded Vale. You then walk into a group of religious fanatics and witness them performing a bizarre ritual. A large alien structure is siphoning their souls from their bodies. The ritual ends in a blinding light that throws you off your feet and you awake to find that the priests are gone. But you are left with a strange feeling residing in your body. Soon you learn that you have been “awakened” and have now become a “Watcher”, someone with the ability to read souls and peer into their past lives, including your own. This will serve as the foundation of the game’s story. You eventually reach Gilded Vale and it seems the winds of fortune are not yet blowing in your direction. The village has been afflicted by the “hollowborn” curse, which leads to children being born without souls. You, with the help of your newfound powers, end up unravelling a large conspiracy that threatens to destroy the very fabric of mankind. You decide to do everything in your ability to solve this grand mystery and restore the world to peace. 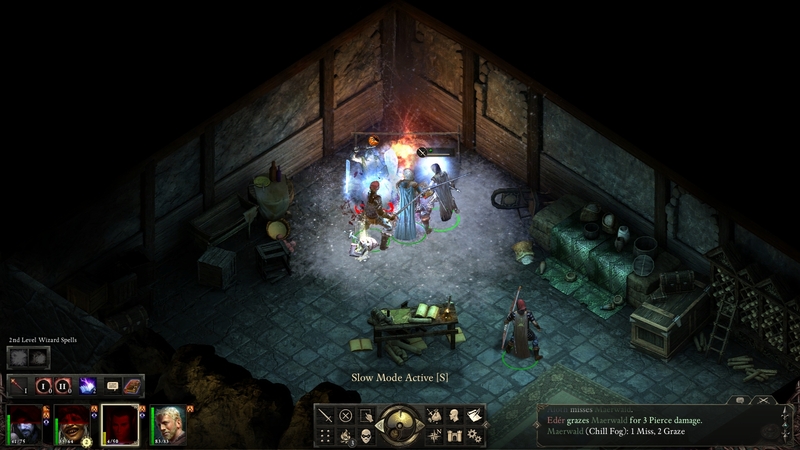 Pillars of Eternity boasts an impressive network of interwoven stories, which breathes spectacular life into the game’s fictional fantasy world. It has been ages since I’ve played a game with such narrative depth. Every book you read, every person you talk to, every choice you make, it all further enhances the believability of the story you are exploring. There are so many stories within stories. Unlike other RPG games, everything seems interconnected. Side quest aren’t simple time-wasters that keep you busy or earns you coin. Everything you do is connected in some way and will affect the outcome of many events. Discovering each story brings the world more and more alive. You will meet an immense host of extremely vivid and distinctive characters, some of them who will end up accompanying you on your journey. These characters are so rich and vibrant in nature, each with their own distinguishing personalities, that it will take mere minutes for you to grow attached to them. This is a remarkable feat for developers to accomplish and something I seldom see and feel in games. Obsidian Entertainment knows how to make a RPG title and truly understand the meaning of role-playing. There are no obligations. You are simply thrown into a world, that is an amazing blend of fantasy and medieval, and you can experience it in any way you choose. Pillars of Eternity is not a game for the impatient who are interested in simple and fast paced game play with mind blowing cinematics. In fact there are no cinematic scenes to be found in the game, just raw and pure game play. Beyond the captivating narrative, it offers an extremely intricate and tactical gaming experience that will require you to do a lot of micro-management. 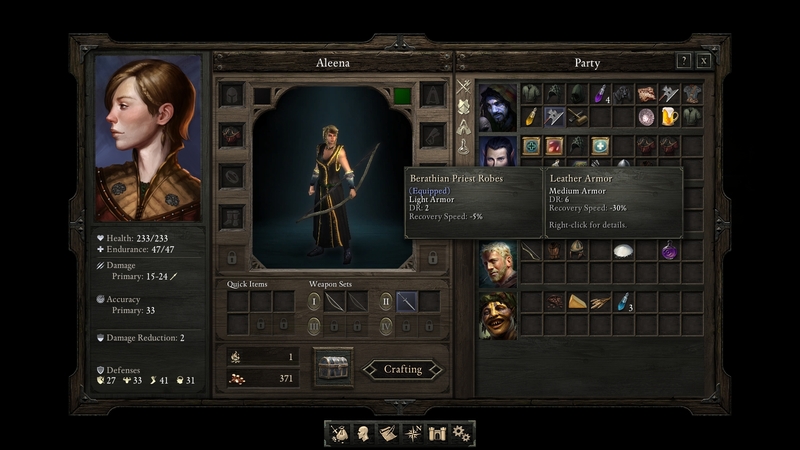 You will spend a lot of your time reading through dialogue and choosing responses, managing your characters’ inventory and customising their abilities (among many other things). Even when entering battle you will constantly have to pause and redirect your orders; otherwise you are basically charging your characters to their deaths. It’s not a game that relies on reflex and coordination but a game of that requires in-depth strategic thinking. When the game starts you will be taken through a very elaborate character creation process where you will make choices between races, race history, individual history, class, branch of class and power points. This is only what I can remember at this very moment. It is important to note that this game will take up a lot of your time. It starts slow and very slowly picks up pace, and it will take you a while to get the hang of it all. But once you do, it will rapidly start taking over the life beyond your screen as it is as addictive a game as can be. You will be able to control 5 team members at any given time. Some of these members will willingly join your entourage but others you will have to hire via Inns and Strongholds. Try to have a good variety of classes in your team so that you are better prepared for the dangers of the world you are exploring. Strongholds are large castles or fortresses you will acquire through various missions. They act as a strong base of operations. Among many other things, you will be able to recruit new companions and rest for free (which usually comes with long lasting bonus attributes). They will also earn you reputation and wealth which will alter the way the other characters view you in the game. You will exclusively be making use of fast travel to explore the world and will only be able to travel between map locations, never seeing the roads in between. Fast travel can only be used from the edges of the areas you find yourself in (indicated by a “North” symbol) but fortunately each area isn’t as big as it would seem at first (although there is a healthy amount of map locations to discover). There is much more I can tell you about Pillars of Eternity but such is the immense nature of this game that it would probably take the length of a novel to do so. I think this in itself says a lot about Pillars of Eternity and those who would be interested in its experience. 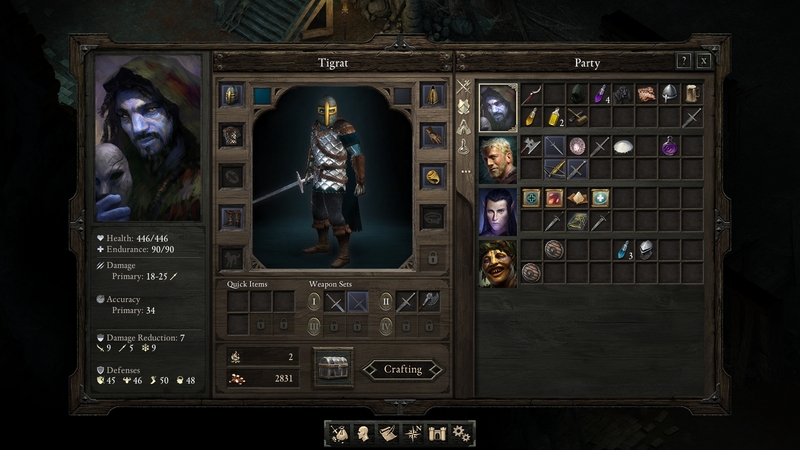 Verdict: Pillars of Eternity is not a game that will fit everyone’s fancy. Some will see it as excruciatingly boring and long-winded while others will shower it with praise. But that will simply be a matter of taste. For what it is, a unique, raw and incredibly in-depth experience in a brilliantly vibrant fantasy setting, it surpasses almost any games of the same recipe. Personally I see it as a remarkable achievement in both the RTS and RPG genres and as a respectful ode to past titles such as Neverwinter Nights and Bulder’s Gate. Pillars of Eternity is like a fine wine: some will not notice its appeal while others will bask in its magnificence.